Mass Effect fans will welcome more Mass Effect in their lives. It's a great achievement but there's no great advancement on Mass Effect 3 and new players would be better off starting with that as it's more accessible. Note: As we published this a large patch appeared which updated graphics and fixed some glitches and annoyances. We recommend reading about them on the Mass Effect subreddit to check them out without spoilers. The patch doesn't affect what's written here or our conclusions. There have been a fair few reviews of this game which treat it as a regular video game and as such find it a long, tedious grind. We’re 50 hours in. We’ve probably not got nearly as far as other people in that time, but there’s a very good reason for that. It’s because Mass Effect isn’t merely a game – that’s just one aspect. It’s also an interactive movie and a lore-filled science-fiction/fantasy book with a bible’s worth of back stories and historical notes - comparable with the massive Appendixes of The Lord of the Rings (the books not the films). This is why the franchise has represented wonderful and absolutely-staggering achievements in its previous three outings. But there are some VERY BIG CAVEATS if you’re expecting to just rock up and “play” Mass Effect for the first time. You’ll likely hate it. We did. The game is structured in a way where you can focus on racing through it, ignoring the long, interminable backstories and shooting your way through everything. If you like to do this, stick with Gears of War which is much better. New players will also baulk at the number of cut scenes – it’s not fun to play when you're a passenger and there’s literally nothing to play. And then there’s all the reading material. There’s absolutely, er, masses of it. You don’t have to read it all by any means, but it can be a rewarding experience to do so. So now that you understand that it’s not strictly a game but an interactive game-movie-book, you also need to understand that the prime focus of this game-movie-book isn’t actually the story or the plot… IKR! It’s the characters and their interactions. This has been the great success of the previous Mass Effect games but it’s also the major focus of the new Andromeda game. 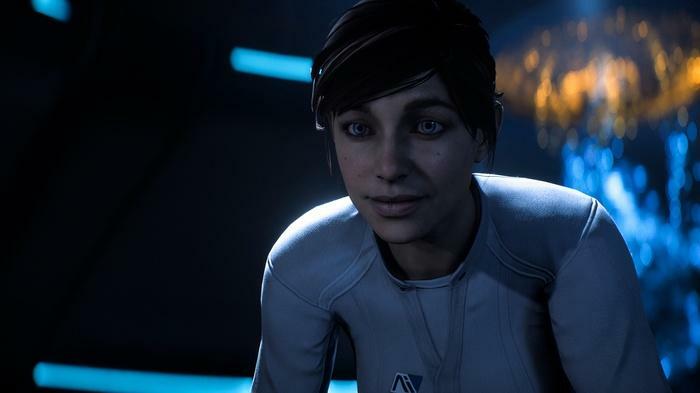 And the problem with the new Andromeda game is that we spend so long at the beginning of the game meeting and talking to new characters that the story takes a back seat. In fact, it’s only many many hours into the game that a potential story even rears its head. In fact I’m still not totally sure that there is a story and that this isn’t going to turn into some kind of SIM-City-type world-building game long down the line. In the original Mass Effect, a similarly-long introduction bored the heck out of me because my expectations were for a rip-roaring space adventure. But even that quickly told you what was happening and what was going to happen down the line through the next two games. Nonetheless, shortly after starting ME:1 I got bored with the grindy running and below-average combat and shelved the game... until ME:3 came out with all it’s hype. That was far more gripping from the off. The previous two games were presented as a quick back story and we were off and flying. The story was great and the relationships with the other characters, some of whom you could actually flirt with and even shag, was amazing. All players will have fond memories of them - think how you look back on Han Solo and Captain Picard. Many ME players will think similar of Shepard and Garrus. Anyhow, after finishing ME:3 I went back to ME:1 and ME:2 and played them like prequels. It was great. So with that lengthy preface all done, what’s the new Mass Effect: Andromeda like? Mass Effect: Andromeda – what’s going on? Quite simply, thousands of the Milky Way citizens comprised of the various species that we met in ME: Original Trilogy have decided, for multiple reasons, to ship out on a 600-year, no-coming-back, expedition to the Andromeda Galaxy to start new lives. However, the high hopes and plans immediately go awry when the reality of unforeseen circumstances hit home. You play a twin – male or female – we chose female as the voice acting last time round was superior. We were not disappointed this time. You’re part of the Pathfinder team and you need to find new worlds and get them ready for settling. There’s no “The Reapers are coming and we need to prepare” universal plot arc here. As such we don’t know how it’s all going to end (at least I don’t 50 hours in). The early plot does indeed centre around SIM Earth lines – get a planet ready for habitation by clearing hostiles and fixing the atmosphere. That’s underplaying it (a lot) but it’s also why some early reviews have been WTF regarding game play: we’re not following clues to see what happens in the great story here, we’re literally doing the job of the Pathfinder team. Jobs aren’t fun unless you’re passionate about doing them. Many new players won’t have signed up for this. That said, if you’ve spent a load of time exploring a region of space and make first contact with an alien species… it feels like you’ve earned it. Of course there are also a ridiculous number of side quests which do require you to follow clues, but anyone who’s played any RPG ever will be familiar with these seek-and-return mini time vampires. To sum up general gameplay to a non-fan, it’s like a poor-man’s Gears of War playing a watered-down SIMs in an oversized, low-graphics Skyrim-like sandpit with lots of talking. And reading. And yet I’m still hooked. To sum up the general gameplay for existing fans… it’s Mass Effect 3 reworked into a bigger universe. We can’t help be disappointed by the lack of graphical advancement in Andromeda. We played on the Xbox One and while some polish has been put on new textures and expressions, it doesn’t feel much different to ME:3 whatsoever. We reviewed the game on XBox One but the only significant graphical improvements appear on PC. Here is a version of Ryder but you can choose many different faces for your hero/heroine. The number of expanded options can be a bit bewildering at first. You can still make new armour and weapons with various enhancements but there are now three different full-complement tech trees to get to grips with. There are also more character profile types to play with and more of, well, everything. It can be overwhelming at first but if you’re playing the game at a slow, completionist pace, it does all become natural eventually. Multiplayer is only slightly-enhanced compared with before. There are survival missions and general shoot-outs – and many people seem to be playing – but it’s very much a poor man’s Gears of War. However, it has also been cleverly integrated into the main game: you can either enter the online environment to earn even more perks and enhancements or remotely send teams off to try and complete the mission for you over a period of hours… so you needn’t miss out on ALL the perks if you have no interest in playing it.